After a wonderful vacation, I arrived home to a stack of Passover price-lists from my suppliers. Lots of people are surprised to hear that I’m working on Passover orders before we even start thinking about Purim — but that’s how it works. On the other hand, some customers have already started asking if the matzo has arrived yet! For the last two weeks I’ve been going through the price lists. I’ve been comparing prices and trying to find the best deals for our customers. It’s exciting to see that there are some new products available — hopefully they won’t disappoint. After the orders get faxed and emailed in this week and next, we’ll be working on our prepared food order form. Each year we cook and bake for 100+ families over Passover. Then the trucks will start rolling in with orders and right after Purim we’ll turn the store over for Pesach (all chometz gets packed up and the entire store gets stocked with KFP items). Just thinking about this exhausts me. Have you started thinking about Passover yet? No, I had not started thinking about it yet. Your post reminded that I should do that soon. 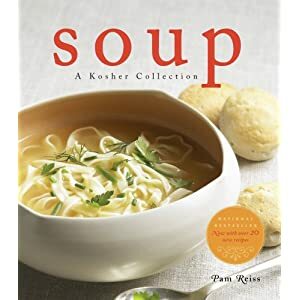 With the snow today, I am thinking Matzoh Ball Soup for dinner though.